If you’re planning to visit Yosemite National Park but only have one day, use this itinerary to make the most of your visit. I always try fitting too many things in to a holiday and our West Coast America two-week road trip was no different. Having visited Yosemite National Park, I’d advise 2-3 days to do it the full justice it deserves. But, if you’re in a similar situation to us, this one-day itinerary will help make the most of your time. Yosemite is located in Californias Sierra Nevada Mountains. It known for it’s picturesque views, rugged cliffs and stunning waterfalls, including the largest waterfall in North America; Yosemite Falls. It attracts over 3.5million visitors every year and is now a UNESCO world heritage site. We spent a day at Yosemite during our journey from Las Vegas to San Francisco as part of our West Coast America road trip. Allowing for lunch and dinner stops it took about 10 hours in total to drive from Vegas to Mariposa where we were staying. Trying to sign within a budget meant that accommodation in the park itself was off the cards. For our day in Yosemite we stayed in nearby Mariposa at The Miners Inn. It proved a great base for a day trip into the national park itself taking about 45 minutes by car. Pack for all weather occasions! When we arrived at Yosemite early in the morning, the rain was coming down by the bucketload, yet by the end of the day the sun was blazing so bring weather for all seasons. Here is my suggested itinerary of short hikes that can all be done in one day. KEY INFO: Both the Lower Yosemite Falls loop and Mirror Lake Loop are open all year round however if visiting in the Winter parts of the Vernal and Nevada Falls Trail may be closed due to icy conditions. The short loop to Lower Yosemite Falls is a relatively quick and easy route. Look for shuttle stop 6 for the entrance to the loop and providing it isn’t a busy day you should be able to park relatively close rather than using the car parks which are a long walk. Depending upon how quickly you can take selfies, the route should not take longer than half an hour. Unbeknown to us when we set off, Mirror lake is actually a seasonal lake that forms when the snow on surrounding cliffs melts . As you’ll spot from my photos, it was empty during our Autumn trip. If you’re visiting during spring and summer, you’ll be rewarded with a beautiful reflection of the surrounding cliff. Visit in Autumn or Winter for beautiful snowy surroundings and the opportunity to stand in the middle of a lake! The paved trail to the “lake” would take roughly an hour in total, however I’d recommend taking the full loop which took roughly 3 hours. After an easy morning of straight forward walks, spend your afternoon in Yosemite National Park trekking up to the top of Nevada falls. We witnessed a man taking a push-chair up this path, when you experience the path you’ll understand why this was such a big deal! The mist trail starts at shuttle point 16. You can also take the John Muir trail up to Nevada falls, it takes a little longer but will be less crowded during busy months. There are lots of great viewpoints on the mist trail including the vernal falls footbridge and the top of vernal falls. Once you make it to Nevada falls you’ll be rewarded with a beautiful view. Get up close to Nevada falls to understand exactly why it is called the mist trail! We were lucky enough to make some Yosemite friends. Know when it gets dark – when hiking a trail, remember to allow time to finish the hike before it gets dark. If you’re visiting in Winter it will go dark a lot earlier than summer – check google for an estimate of sunset time. Check opening times and road closures – seasonality will make some paths inaccessible during certain parts of the year so check ahead. It is also worth checking for road closures in and around the area before you travel. Keep an eye out for deer – if you’re driving around Yosemite watch out for deer sprinting across the road as it does happen. Use the store – If you forget a raincoat (as I did), you can buy one from the village store and if you don’t end up using it you can return it for a full refund. Go early – especially if you’re only visiting for one day, make the most of your time at Yosemite National Park with an early start. Beware of bears – Whilst brown bears are now extinct at Yosemite, there are at least 300 black bears roaming the park. If you stick to the paths like this itinerary suggests then you should steer clear of any bears. Still be very cautious and don’t leave food or waste lying around. Yosemite is the third biggest park in America. It is one of the oldest nature reserves in the United States. One of the trails is named after John Muir, a Scottish immigrant who helped raise awareness of the beautiful area which eventually lead to the creation of the national park. There are over 800 miles of walks around the park. I hope this was helpful. 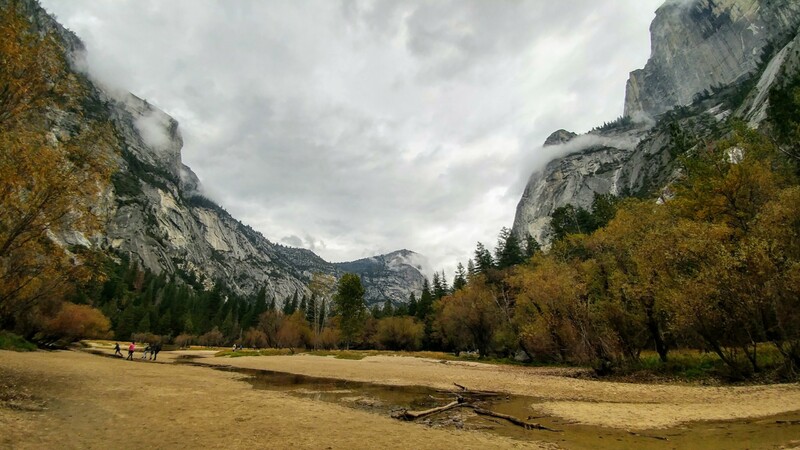 Visiting Yosemite National Park in one day is possible but if you’re able to spare a few extra days there are many more sights to see in this stunning area.